The feet secure and firm upon the ground. And hear my mother's echo in the sound. In a firm continuum of mind. The voice before me echoing behind. When I first saw my great-great-grandmother Magdalena's portrait I felt as if I was looking at a face that was strangely familiar. 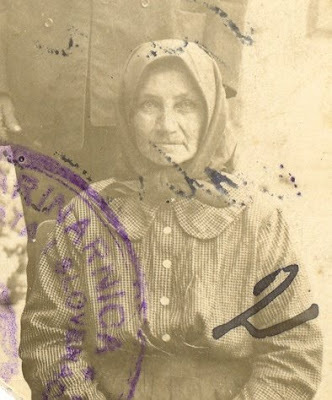 I had known her name and felt a connection to her as I had wondered about her life and how she had raised her children in the late 19th-century in Legrad (then Hungary). Her daughter Ilona had been very close to her own daughters throughout their adulthood, yet as a tender-aged 24-year-old new mother she had left her home country and Magdalena behind. I often wondered about Magdalena's feelings about her daughter's emigration. Had she ever expected to see her again? 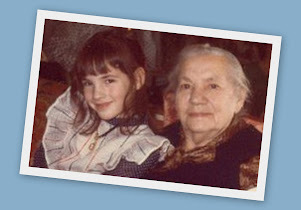 Though Magdalena lived to the age of 97, she never once was able to see Ilona again. Her American grandchildren never had the chance to meet her although they and even their children were well into adulthood by the time of her death. I remember being told that at one point Ilona (now Helen in America) got impatient with her husband Frank's devotion to card-playing and threatened to "go home to her mother" if he didn't give it up. I wonder how many years had passed until Ilona had realized that she would never see her mother again. At least they were able to keep in touch through letters and pictures sent across the Atlantic. 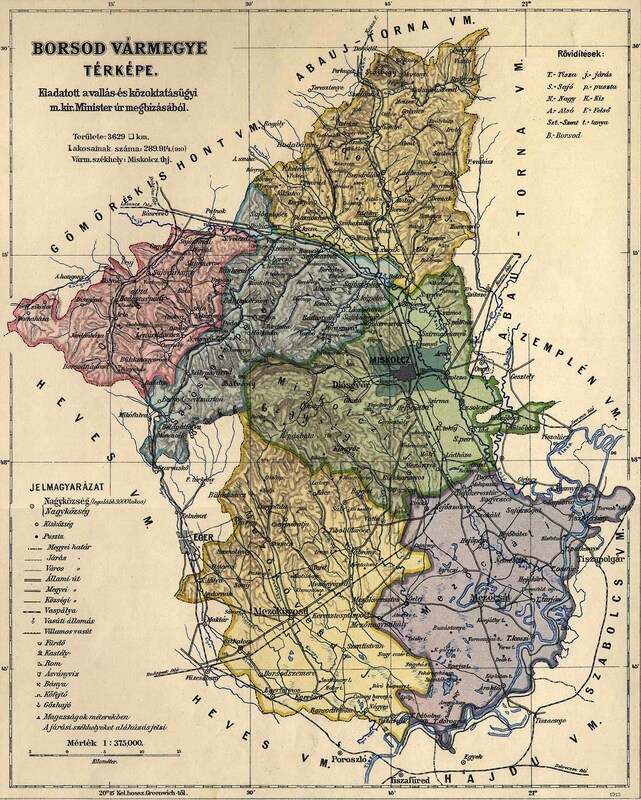 Magdalena's other children, two daughters and a son, remained in Legrad and lived out their lives there. Her daughter Katarina married Juro Simon, her daughter Louisa married Stjepan (Istvan) Vidaković, and her son Adam married a woman named Katarina. By the beginning of the 21st-century, Magdalena and her husband Stjepan (both born in the mid-19th-century) had more than 150 descendants in Croatia and America. 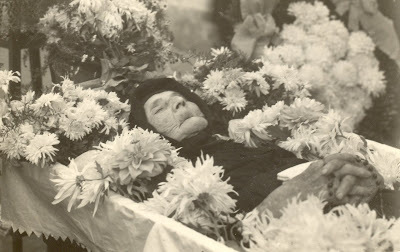 Magdalena passed away in 1957 in Legrad (then Yugoslavia) at the age of 97. I treasure the photos that I have of her funeral and the family that surrounded her as they said their last goodbyes to their beloved mother, Magdalena. I can see clear family resemblances to many of the people in this photo, but I have not yet been able to identify all of them for certain. If you recognize anyone in the picture, please leave a comment or send an email. For more poetry by Dorothy Hilliard Moffatt, see Time for Remembrance: Poems and Too Many Apples. For more photographs that embody a mother's love, visit footnoteMaven's 1st edition of I Smile for the Camera. Wonderful tribute Lisa. I understand the Europeans commonly took pictures of the deceased. The only picture I have of my maternal great grandmother is one where she is deceased with her family around her. How I wish I could have seen an image of her from a happier time. You are indeed fortunate to have the photos you have. What a beautiful tribute - and the photographs are absolutely amazing. Thank you so much for sharing them! I enjoyed reading your tribute to Magdalena . It was so wonderful for you to have these photos of her. How proud you are to link yourself to your family. You have to go in the future & experience your ancestral homeland. That's a wonderful tribute. How fortunate you are to have those photos! I've heard about the funeral photos but I don't have any from my own family...a sad occasion, but what a remembrance. Thanks Jasia, Laura, Barbara and Donna for your comments. I hesitated to share the photos of Magdalena's funeral at first because I was concerned that some might not understand or appreciate that type of image. When I first saw them myself I was not uncomfortable with the photographs. Instead, I was grateful that I had the chance to better visualize my great-great-grandmother's life by seeing her loving family around her as they said their last good-byes. Photographs have the power to take us places where we can never go - such as back in time to the funerals of our ancestors, as these photos did for me. I sincerely hope that no-one will be made uncomfortable by these images. I hope that instead, like me, they would be given an appreciation for the love of a close family and a reminder of the inevitability of death for us all. You have written such a lovely story, and have included some wonderful family anecdotes. 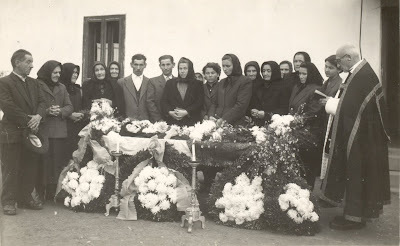 As far as the funeral photographs. It appears that taking photographs of deceased loved ones used to be commonplace, however with time we seem to do this less. Perhaps it is because the current generations are feeling more uncomfortable with the death process itself. I find it so amazing when we see parts of ourselves in our ancestors - especially those we never had the opportunity to meet. On your funeral photos - at least it wasn't just my family who took funeral pictures. Thanks for sharing! For more from Lisa, visit Smallestleaf.com. Now available in two formats: as PDF downloads from the Legacy Family Tree website and as Amazon Kindle eBooks . 100 Years in America © 2007-2015 by Lisa / Smallest Leaf. All Rights Reserved. For use of articles and images, please contact the author. Easter traditions: Decorating eggs and... fighting! My new Catholic Genealogy QuickGuide™: Let me help you find those Catholic ancestors! 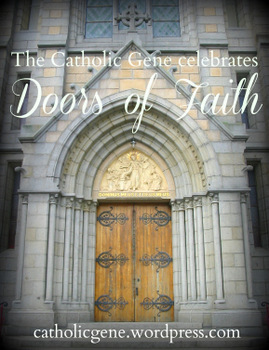 The Catholic Gene celebrates church "Doors of Faith"
Read my article The Gift of the Photograph: Uniting Families With Their History within footnoteMaven's Shades of the Departed's Friday from the Collectors series. 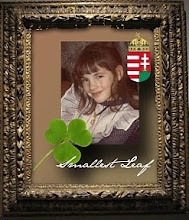 A decade has flown for Small-leaved Shamrock! News for Smallest Leaf: a new website and a new book! Céad míle fáilte (one-hundred-thousand welcomes) to our Irish heritage blog carnival! Nedamo Dravu nit za živu glavu! 100 Years in America © 2007-2015 by Smallest Leaf Press. All Rights Reserved. 100 Years in America © 2007-2014 Smallest Leaf. Picture Window theme. Theme images by bopshops. Powered by Blogger.